2015: "Queen Nanny: Legendary Maroon Chieftainess"
United Nations Remember Slavery Programme and Partners Recognize People of African Descent at events in Washington, D.C. 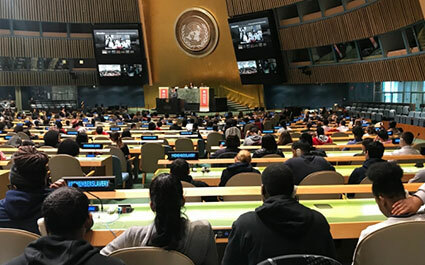 The 10th Annual Global Student Video Conference on the Transatlantic Slave Trade at United Nations Headquarters on 27 April, gave students from the United States, Mexico and the United Republic of Tanzania an opportunity to learn about the struggle of people of African descent towards freedom and equality. 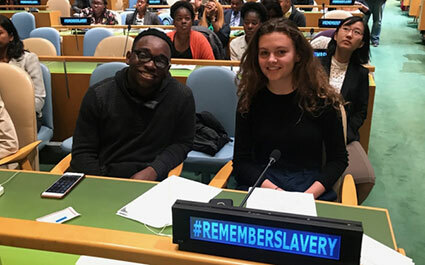 It was one of several events organized by the Education Outreach Section to mark the International Day of Remembrance of the Victims of Slavery and the Transatlantic Slave Trade. Under-Secretary-General for Global Communications Alison Smale opened the conference with a video message. 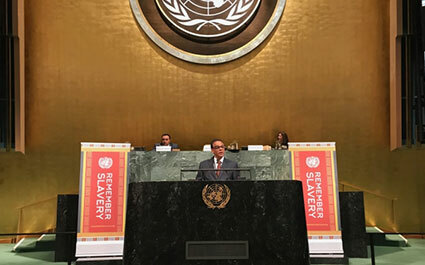 Mahammed Naguib Soomauroo, Deputy Permanent Representative of the Republic of Mauritius to the United Nations, explained the fight for freedom waged by slaves at Le Morne Mountain during the 18th century. “Le Morne Mountain is a testament to the maroon movement, where the enslaved engaged in a relentless struggle to escape oppression and search for freedom,” said Mr. Soomauroo. Professor Christian Crouch, Associate Professor of History and Director of American Studies at Bard College in New York, delivered the keynote address, highlighting the contribution of rebel leaders in the struggle for freedom and equality, including Sebastián Lemba in the Dominican Republic, Maroon Leader Queen Nanny in Jamaica, and Toussaint Louverture in Haiti. 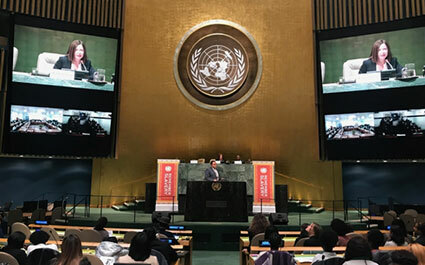 Angela Missouri Sherman-Peter, Permanent Observer of CARICOM to the United Nations, led the students in an exercise highlighting the achievements of people of African descent. 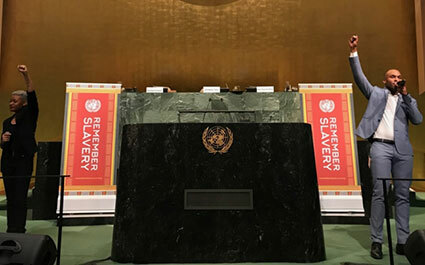 Hossam Younes, a project architect at Rodney Leon Architects, took students through the design elements of The Ark of Return, A Permanent Memorial to Honour the Victims of Slavery and the Transatlantic Slave Trade at the United Nations. The memorial was unveiled at United Nations Headquarters in March 2015. 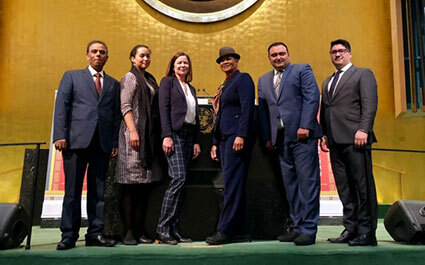 Students from New York City, along with students teleconferencing in from Mexico and Tanzania, presented their research on individuals and events that were significant in the struggle for freedom and equality. They discussed the responsibility of Governments to ensure justice for all and defend the human rights of every member of society.